tralac maintains a collection of regional and national trade-related resources including copies of the texts and annexes of regional and bilateral trade agreements, copies of various regional protocols, memoranda of understanding and tariff offers, and copies of national legislation and trade-related policy documents. These resources can be accessed below by regional bloc (use the maps to navigate to each regional resources page) and by country. * Registration is free of charge and for statistical monitoring purposes only. By registering as a member on this site, you agree to abide by tralac’s Terms and Conditions. 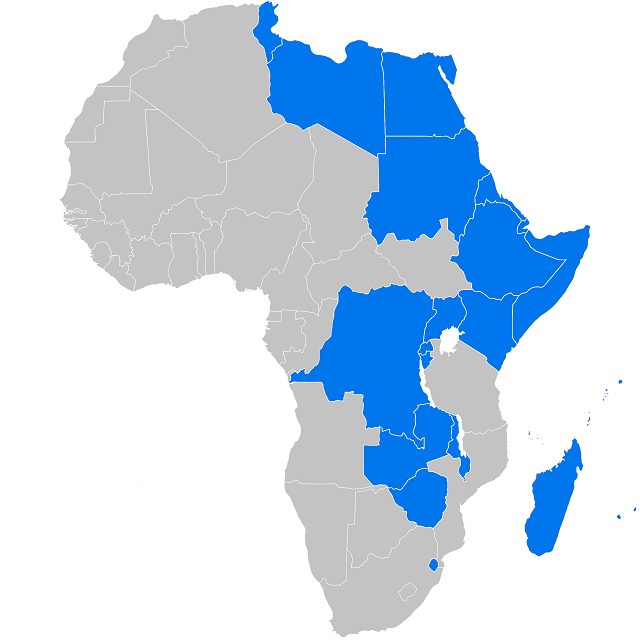 The Common Market for Eastern and Southern Africa (COMESA) was established on 8 December 1994, replacing the Preferential Trade Area for Eastern and Southern Africa which was set up in 1981. COMESA has adopted a developmental approach to regional integration, with its main objective being the formation of a large economic and trading unit capable of overcoming some of the barriers that individual states face. COMESA launched a Free Trade Area on 31 October 2000 followed by a Customs Union in June 2009, although the latter is yet to become operational. COMESA is the largest regional economic community in Africa with 21 Member States: Burundi, Comoros, Djibouti, DRC, Egypt, Eritrea, Ethiopia, Kenya, Libya, Madagascar, Malawi, Mauritius, Rwanda, Seychelles, Somalia, Sudan, Swaziland, Tunisia, Uganda, Zambia and Zimbabwe. 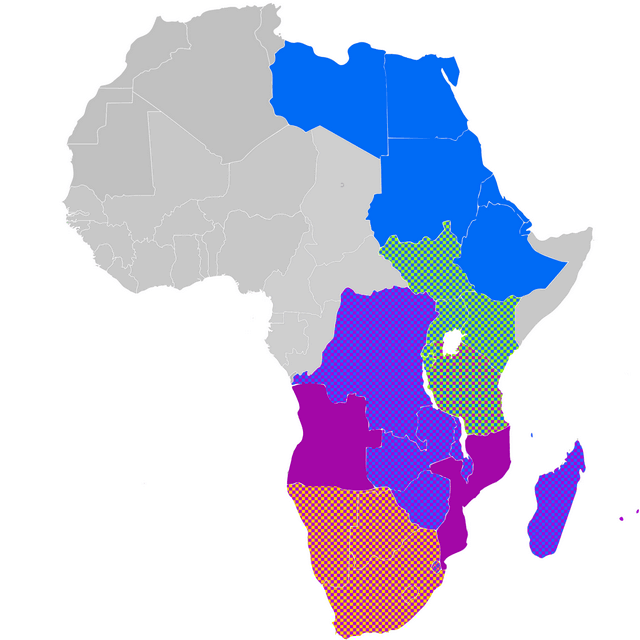 The East African Community (EAC) was established as a regional intergovernmental organisation on 7 July 2000. Regional trade integration is a cornerstone of EAC Members’ trade policies. The first regional integration milestone, the EAC Customs Union, was launched in 2005, followed by the second milestone, a Common Market, in 2010. The EAC is working towards establishing a Monetary Union and ultimately a Political Federation of the East African States. The EAC currently consists of six Member States: Burundi, Kenya, Republic of South Sudan (admitted in April 2016), Rwanda, United Republic of Tanzania, and Uganda. For more on the EAC-EU Economic Partnership Agreement, visit the Africa’s external relations page. The Southern African Development Community (SADC) was established on 17 August 1992 with the adoption of the SADC Treaty, redefining the existing Southern African Development Coordinating Conference which was established in 1980. The Treaty sets out the main objectives of SADC – to achieve development and economic growth, alleviate poverty, enhance the standard and quality of life of the peoples of Southern Africa, and support the socially disadvantaged through regional integration. To this end, SADC launched its Free Trade Area in August 2008. 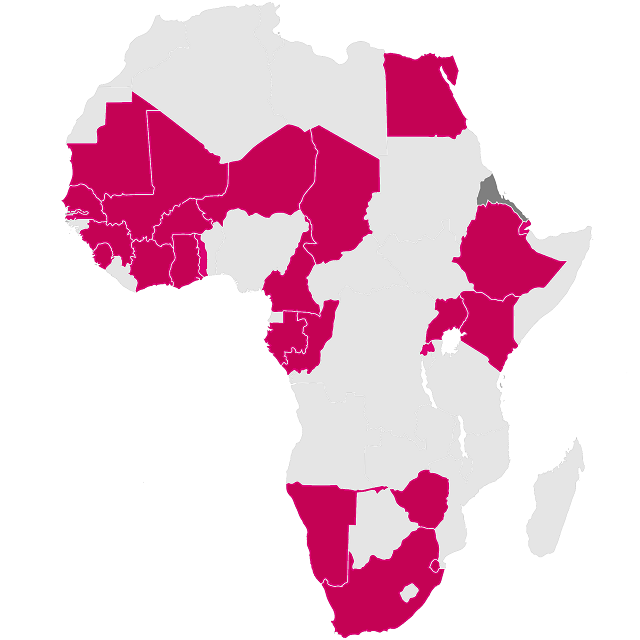 SADC currently consists of 16 Member States: Angola, Botswana, the Democratic Republic of the Congo, Lesotho, Madagascar, Malawi, Mozambique, Mauritius, Namibia, Seychelles, South Africa, Swaziland, Tanzania, Union of Comoros, Zambia and Zimbabwe. For more on the SADC-EU Economic Partnership Agreement, click here. The Southern African Customs Union (SACU) was established in 1910 between Botswana, Lesotho, eSwatini (formerly Swaziland) and South Africa. It is the oldest Customs Union in existence. The SACU Agreement was renegotiated in 1969 when Namibia gained independence from South Africa and became a contracting party to the Agreement. It was subsequently renegotiated amongst the five member countries in the mid-1990s which culminated in the signing of the new SACU Agreement in October 2002. Annex 1 of the 2002 Agreement details the Revenue Sharing Formula that is used for determining each Member State’s share out of the Common Revenue Pool. The implementation of the new Revenue Sharing Formula began in 2006. The African Union remains committed to implementing its regional integration agenda through its 8 Regional Economic Communities (RECs): COMESA, EAC, and SADC in the east and southern Africa region, along with ECCAS, ECOWAS, IGAD, AMU, and CEN-SAD covering Central, West and Northern Africa. Although some significant progress has been made to date, the multiplicity of inter-governmental organisations in Africa (currently 14) and overlapping memberships in the RECs poses a challenge for African integration and the implementation of regional agreements. In addition, a COMESA-EAC-SADC Tripartite Free Trade Area (TFTA) has been concluded, and the African Continental Free Trade Area (AfCFTA) Agreement – covering all 55 AU member states – was signed in March 2018 and is expected to enter into force in early 2019. Click on the maps alongside to find out more. The member states of COMESA, the EAC and SADC agreed in October 2008 to negotiate a Tripartite Free Trade Area (TFTA). The TFTA was officially launched in Sharm El Sheikh, Egypt on 10 June 2015 where Heads of State and Government had met to conclude outstanding negotiations on rules of origin, trade remedies and tariff offers. However, due to a number of challenges faced in the process, the deadline of June 2016 was not met, and the commencement of Phase II negotiations – covering trade in services and other trade related matters – has been delayed. The TFTA Agreement has been signed by 22 of the 27 member countries; only three countries – Kenya, Egypt and Uganda – have both signed and ratified it. The South African Parliament is in the process of ratifying the TFTA Agreement. In January 2012, the 18th AU Assembly endorsed a comprehensive framework towards the attainment of developmental regionalism in the continent, through its decision to establish an African Continental Free Trade Area (AfCFTA). The main objectives of the AfCFTA are to create a single continental market for goods and services, with free movement of business persons and investments. Once implemented, the AfCFTA will cover a market of more than 1.2 billion people with a combined GDP of more than US$3.4 trillion. The consolidated text of the AfCFTA Agreement was signed by 44 of the 55 AU member states on 21 March 2018 in Kigali, Rwanda. Since then, an additional 8 countries have signed the AfCFTA Agreement, bringing the total number of signatories to 52. To date, 15 countries have deposited their instruments of ratification with the AUC, and an additional 4 countries have received parliamentary approval for ratification. The total number of ratifications (approved and deposited) now stands at 19 of the required 22 for implementation to begin. With a view to accelerating the process of economic and political integration in the continent, the Constitutive Act of the African Union was adopted in 2000 at the Lomé Summit and entered into force in 2001. The vision for the AU is to support the empowerment of African states in the global economy while addressing the multifaceted social, economic and political problems facing the continent amidst increasing globalisation. With the adoption of the Treaty Establishing the African Economic Community in 1991 (the ‘Abuja Treaty’), the AU is working towards the establishment of an AEC through six successive stages, using the Regional Economic Communities (RECs) as building blocks, culminating in an African Common Market. Agenda 2063 was formally adopted in January 2015 as a strategic framework for the socioeconomic transformation of the continent over the next 50 years. The AU currently consists of 55 member states. As Africa confronts the challenges of the evolving international trade landscape and global economy, the nature of its trading relationships has been undergoing significant shifts. While trade with its traditional trading partners, particularly the European Union and the United States, has been declining, trade ties with emerging economies and global players, notably the BRICS (Brazil, Russia, India, China and South Africa), has been steadily increasing. Africa also remains committed to pursuing regional integration initiatives that can contribute meaningfully to increased intra-African trade. Click on the image below for further details and resources on BRICS’ trade and economic cooperation, the Economic Partnership Agreements (EPAs) with the EU, Brexit and the future of Africa-UK trade relations, and multilateral trade developments at the World Trade Organisation (WTO).